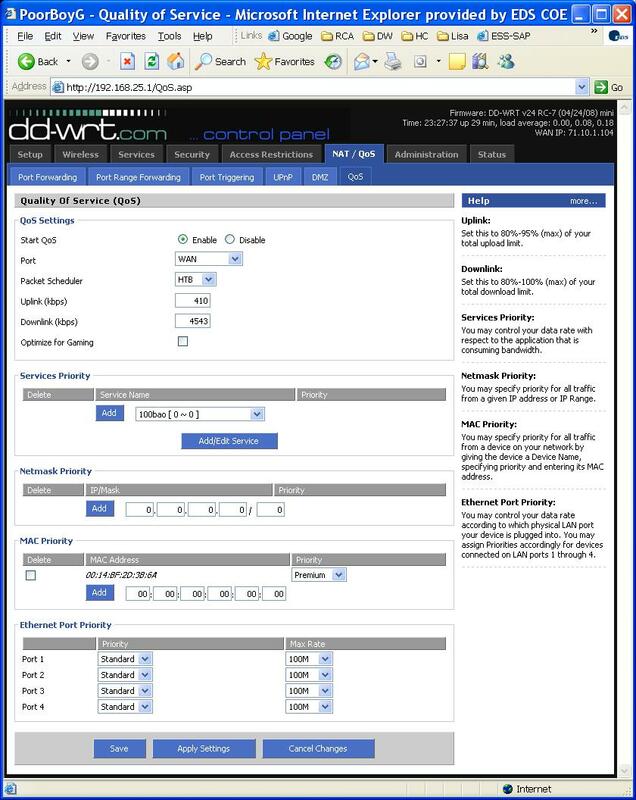 DD-WRT Forum :: View topic - Vonage and QoS finally figured out!! Vonage and QoS finally figured out!! Posted: Sun May 11, 2008 3:30 Post subject: Vonage and QoS finally figured out!! Finally got a good config for vonage. Thank god!! Been living with vonage hell where anything being sent just killed my vonage. This is for charter 5mbit service. The MAC of my vonage adapter is 00:14:BF:2D:3B:6A and is plugged into the DD-WRT router. It is set to Premium quality. The ports are all set to Standard. I have specified 90% download link and 80% upload link for the QoS setting. So that is 4543 and 410. Attached is my working config. I rose my download link bandwidth some. I am not sure what this setting aside is for. Not sure if I am supposed to set as the bandwidth vonage uses or not? Vonage calls are only like 13k a sec. I use 500 kbit margin because internet speed in realty is not maxed out all the times, can fluctuate. I noticed you added the MAC, is there a reason you didn't just set the Physical LAN Port that it is plugged into as Priority/Premium. Did you already try this? Still means a 45 minute wait. just in case someone was rearranging things and plugged it into a different port. didn't test it though, probably works fine. Posted: Wed Aug 20, 2008 23:29 Post subject: Re: Vonage and QoS finally figured out!! Please excuse the noob questions, but where do you get the figure to apply the 80 and 90 % to? Posted: Wed Aug 20, 2008 23:44 Post subject: Re: Vonage and QoS finally figured out!! That's a perfectly valid question. The values stated are shown in the Help section on the QoS page at the top right. The word help is a link. As for the values, and why they were chosen, I don't know. However, basic knowledge and common sense tell us that your Internet Service Providers Speeds are usually Maximums and rarely CIR (confirmed Information Rates - like a T1 of 1.544) So in order to gain the best consistant throughput you would put in values lower than your Maximums to avoid delays from retransmittals. Most of my customers use Cable or DSL providers and we are just now getting consumer Fiber Optic services. I have found that using 75% of download on cable, 85% download of DSL and 95% of Download on Fiber produce the highest consistant speeds, and allows for up to 20 Concurrent users on one WHR-HP-G54. If I go lower or higher, I drop to 12-15 users and the Unit locks up. Hope this helped. I use a cable provider (Comcast) and it seems that when I do speed tests to get some bandwidth numbers to set my QoS settings with, they are a bit inconsistent. Partially this is to do with the SpeedBoost technology they implement which ups download speeds considerably (bt 20-30MBps!) but I don't normally see this consistently. I tried using the MAC setting in DD-WRT and setting the priority to Express. This did work a bit for my Vonage adapter and cleared up the jitter experienced by callers when I have BitTorrent running. I am thinking that I might do the setting for just the Port instead as I never move my Vonage adapter and may be able to have better control on the QoS settings by doing this. I don't really know if the QoS settings are in effect ALL the time with the MAC setup or only when someone would be using the Vonage adapter. It appears to be all the time as my bandwidth to my various computers has declined considerably. I also don't know that if I adjust the uplink/downlink settings up or down how that affects my overall available bandwidth. I read elsewhere I probably need to go ahead and do QoS settings for uTorrent by finding out which port(s) it uses and set it up for the Bulk priority. I am quite new at this whole QoS thing but would like to get a better understanding of it soon. Thanks for any thoughtful input here!